I loooove breakfast! This is one of my favorite breakfasts to wake up to. I make it the night before so that I'm organized and I can save some time. Love love love! Chia seeds are my new obsession too. They have omegas and fiber and they give you energy. I throw them in my smoothies and make pudding with them. I've also put them in cookies and other baked goods. 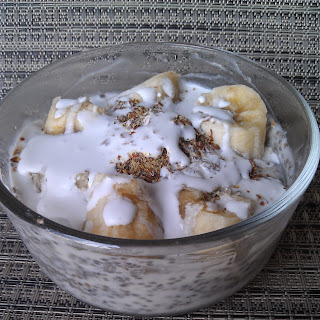 Put the yogurt and chia seeds in a small bowl. Stir well. Slice the banana and add it to the yogurt. Top with peanut butter and flaxseed meal. Refrigerate overnight and when you're ready to eat, drizzle some coconut milk on top.